On Creation Day 5, God filled the new oceans with fish, whales, and other swimmers, and filled the skies with flying creatures. This was the first part of another two-day process to put animals on the earth. The classic model of animal evolution says that animal life began in the sea and then invaded the land. The model further says that birds “evolved” from other animals (reptiles) that already roamed the land. Those who conclude the above, assume that eroded sand and mud buries creatures in the order of their life or death. Hence, creatures in the deeper fossil layers lived and died earlier than creatures more “shallow” to them. For that reason, those who try to reconcile the Bible with conventional models have a serious problem. Whales are swimmers, too, and the Bible says that God made all swimmers earlier than He made the “walkers” and “crawlers” of the land. Yet one finds whales in the shallow parts of the “geological column,” hence the conventional idea that whales “evolved,” and derived, from walkers. “Theistic evolutionists” cannot resolve this. Aristotle famously said that when one part of your argument contradicts another, you need to check your premises. You will invariably find that one or more of them is/are false. Kronosaurus queenslandicus. Note the crocodile-like jaw. Photo: User ????? (Vikipyediya Russkaya); released into public domain. The Bible, and specifically Genesis 1:20-23, says that God formed all swimmers at once, and also formed the flyers. The swimmers include a class of very large swimmers. The Royal Commission under King James I of the UK called them “great whales,” but the whales of today are a subset of these giant swimmers. The New American Standard Bible calls them “sea monsters,” but that description is as inexact as it is incomplete. (A monster, from the Latin verb moneo meaning “I warn,” is a creature that someone must warn you about, or a creature that is itself a warning to you.) The original Hebrew says that these creatures were like giant crocodiles. Job gave further details of a creature that he called Leviathan, and that modern man calls “Predator X” (see video below) or kronosaurus. 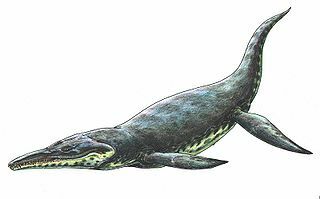 This is a swimming reptile, and was the largest predator that ever lived. The word rendered bird in the Hebrew text is a broader term. It means any creature having wings (or literally, covered with wings). That would include flying mammals (bats) and flying reptiles as well as true birds. As with Creation Day Two, God does not “see that it is good.” God is not finished with the animals. He will finish on the next day, Creation Day Six. This entry was posted in Apologetics by Terry Hurlbut. Bookmark the permalink. The Hebrew Text is beautiful!! In other words, the word transliterated “et” or “eth” would be like our writing “AZ” in English. Or any other language that uses the Roman alphabet. John the Revelator uses the quote, “I am Alpha and Omega” at least twice. Remember the verse in John chapter 1 ‘In the beginning was the Word, & the Word was with God & the Word was God’? & verses 21 & 22 and so on… Every time something new is mentioned that God creates, the signature of Yeshua is there!